When faced with a difficulty or a problem we often attempt to take stock of our situation in order to come to a solution. But taking stock can itself be a complicated process, and there are many ways to disagree about how this ought to be done – just what are the relevant factors? And it isn’t difficult to endow this kind of reflection with an ancient, prestigious lineage: even Aristotle admitted that “all questions are hard to decide with precision” (Nicomachean Ethics IX.2). This rather simple way of characterizing philosophical puzzlement is, I think, an appropriate description of what Charles Taylor has been doing for the duration of his philosophical career; he has repeatedly attempted to make the stakes in any given debate clearer so that a more robust philosophical argument can be made about them – not unlike Aristotle himself. This way of grappling with contemporary problems is on offer once again in his aptly named collection of essays, Dilemmas and Connections. Taylor has been concerned for a very long time about the different ways in which we in the West have attempted to realize our personal and collective goals. His first book, The Explanation of Behaviour (1964), is a work of technical analytic philosophy dedicated to a critique of behaviourist models of explanation like that of B. F. Skinner – a critique which was made in an arrestingly different way in Stanley Kubrick’s A Clockwork Orange (1971). Taylor argued that psychological theories like behaviourism failed to make logical sense of behaviour in their explanations, implicitly suggesting that the goal of behaviour had to be incorporated, and by failing to attend closely enough to our ordinary language in explaining behaviour. In a sense all his subsequent work has been an elaboration upon this theme – what best explains what we do and why we say that we do it? His repeated conclusion has been that some reference to our goals and purposes, personal and collective, must be a part of the explanation. Since this early work Taylor has elaborated this view on a much grander scale in several heady tomes, including Sources of the Self (1989) and A Secular Age (2007). The collection of essays in Dilemmas and Connections offers smaller, thumbnail sketches that meditate on particular aspects of Taylor’s larger project and reveal some of his intellectual sympathies, including Iris Murdoch, Hans-Georg Gadamer, and Paul Celan. 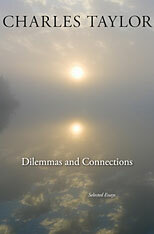 An important theme that runs through Taylor’s work (see chapters 9 and 15 of Dilemmas and Connections; chapter 10 and Part V of A Secular Age) is a narrative about our contemporary moral and political options, which he limits to three general perspectives: 1) traditional religions or philosophies that speak of human flourishing whose perspective includes “life beyond life”; 2) exclusive humanism which restricts human flourishing to an immanent natural world; 3) immanent counter-Enlightenment or immanent non-humanism that rejects the moral sources of exclusive humanism as normative but does not place human flourishing outside the domain of nature. Under the first category we find Greeks and Romans, Christians and Buddhists; under the second we find many of the figures of the radical Enlightenment such as Denis Diderot; and under the third, what Taylor calls the “neo-Nietzscheans”, we find those like Michel Foucault and Jacques Derrida. In addressing our ethical puzzles today Taylor argues that these are the most forceful perspectives. One of the many virtues of Taylor’s work is his clarity, making it accessible across academic disciplines and, as important, to an interested reading public. Yet this virtue can often be accompanied by typical drawbacks, such as repetition, brevity, and oversimplification. While it would be hard to accuse a book of over 800 pages (A Secular Age) of brevity or oversimplification, it might apply when such a work attempts to speak to the whole of human history. It is of course immensely difficult to capture the complexity of Western history (however defined) as an important component of the background against which we operate today, and criticisms directed at this simplification must be taken very seriously – it is for this student of seventeenth-century Europe extremely difficult to swallow a flat pencil sketch of Hugo Grotius and John Locke that serves as a vital component in producing our contemporary world. And where does someone like John Caputo fit in the three perspectives summarized above? Yet simplification can be useful in more than just a banal way. Steven Shapin, a prominent historian of science, has defended his excellent summary of the scientific revolution against the perils of endless qualification and citation by arguing that such accounts “are less likely to be coherent enough to advance our overall understanding.” Given his grand narrative, Taylor is able to meaningfully enter a whole range of debates, from the sociology of secularization to the politics of multiculturalism to the connection between religion and violence. This scope can in fact prove illuminating in a way that hyper-specificity cannot always do, not least by drawing an immense range of scholars into dialogue with one another on some of these important themes. Even if we are not fully satisfied with some of the simplifications of Taylor’s work, there are some insights that can be fruitfully explored and contested. One such insight, to me at least, has to do with what we might call the existential impact of what Taylor identifies as our contemporary ethical options. This makes clear that there is no going back to a time when these competing options were not present. The course of modern history has altered our historical consciousness by altering the background against which our contemporary ethical understanding is realized – we live with dilemmas and connections between traditional religion, Enlightenment and Romanticism, as well as all their permutations and combinations. The complementary side of this no-going-back is an insistence on the validity of the openness to “life beyond life”, the “eternal life” of the Gospel of John (10:10). As Taylor argues, given that rival embedded understandings of human flourishing all operate with a set of goals, realized in various kinds of demands, and always against a background understanding in which they make sense, there is nothing that rules out the traditional religious insight that human beings yearn for something beyond “mere life” without necessarily negating or devaluing that life. But the cost of this openness may be too high for some: it means granting a wide space for all forms of openness, and it means acknowledging that within this openness there is a vast array of possible positions, none of which are, strictly speaking, inherently better or worse than any other. The believer and unbeliever are alike presented with the promise and risk of openness – it is from this common stance that we can hope to elucidate our shared goals, which we can pursue in light of and, more importantly, in spite of some of our important differences. From the vantage point of faith we might recognize in Taylor’s recent work a kind of negative or apophatic theology: in attempting to clarify the stakes of our moral dilemmas today and their connections to one another in a shared history, Taylor has made it apparent that returning to an earlier point in our history is so unlikely as to be impossible, not to say undesirable. What is more, for the Christian this longing for a return rigidly expressed is actually unnecessary: every generation of the church has “realized anew” the meaning of the Christian proclamation. Such creative renewal today confronts the complicated challenge that is our ethical world. Dilemmas and Connections: Selected Essays by Charles Taylor. Harvard, 2011, 424pp.